Which system do YOU want to copycat? One of John Burkes favorite business stories is about a middle-aged manager struggling to pay his bills, so he decides to get some advice from a financial expert. The manager makes an appointment to meet with a well-respected financial advisor whose office was located in a swanky building on Park Avenue. The manager enters the expert's elegantly appointed reception room but instead of a receptionist, the manager is greeted by two doors. One market "employed" and the other "self-employed"
He enters the door market "employed" and is greeted by two more doors, one marked "makes less than $40,000" and the other "makes more than $40,000. " He makes less than $40,000 so he enters that door, only to find himself face to face with two more doors. The door on the left is marketed "saves more than $2,000 a year, " and the one on the right is marked "saves less than $2,000 a year." The manager only has about a thousand dollars in his savings, so he enters the door on the right-- Only to find himself right back on Park Avenue! It's painfully obcious that the manager in the story will never get out of his rut until he starts choosing to open different doors. The mornal of the story is that most people are like the manager -- they choose to enter the doors of life that lead them right back to where they started. The only way for people to get different results is to choose to enter different doors, isn;t that true? Like one of my mentors always used to say " if you continue to do what you've always done, you'll continue to get what you've always gotten"
Are You in the 95% group or the 5% group? How About you? Are you opening financial doors that will lead to you becoming in the 95% group? Or are you opening the doors that will lead to financial independence, or even wealth, like the 5% group? I've got to believe that most people want more for themselves... more for their families... than being dead, dead-broke, or still working to make ends meet by age 65. I've got to believe that if more people understood the full benefits of being in the 5% group, there would be a lot more people choosing to open different doors in their lives. Imagine for a moment that time and money weren't an issue in your life. Imagine being able to walk your kids to school every morning ... and never having to miss a school play or soccer game because you had to work. Imagine planning your work around your golf... instead of your golf around your work. Image going on a vacation and coming back when you want to come back, rather than when your boss says you have to come back. Image paying off your car loan... paying off your mortgage... paying off your credit card bills at the end of every month. Imagine that you are one of the 5%-ers, financially free to come and go as you please. Finally, imagine that by investing one hour of your life reading this book, you will discover what you've always been searching for-- The key to wealth creation! Suppose you had the opportunity to become a 5%-er -- Would you take advantage of it? I sincerely hope the answer to that question is "yes" because that's what this book is all about. In the coming pages you will learn that the secret to financial freedom is knowing which doors to open. 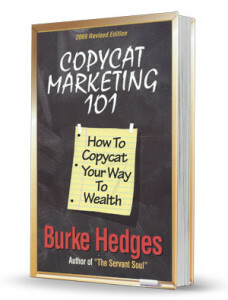 CopyCat Marketing 101 will make you aware that most people are 95%-ers because they've been taught to copy people who are opening doors that lead to salary caps, dead end jobs and financial dependence. In short, most people are copycatting the wrong plan! In this book you will learn that the current system most people copycat is designed to create temporary income -- not true wealth - because it's based on linear growth of trading time for dollars. You will learn that the key to true wealth creation is leverage, and you will learn about a dynamic form of leverage that wealthy people have been copying for centuries called exponential growth. You will learn that the "secret" to wealth creation is available to virtually everybody including people like you and me, because it's based on something that we already know how to do well -- copycatting. Best of all, you will learn how average people can break out of the time-for-money trap by following a simple, duplicatable system of wealth creation that will open the door to financial freedom, once and for all! Introduction: If You Don't Like Your Results, Change your approach! Chapter 2: What Is "True" Wealth? Chapter 7: Network Marketing: The Ultimate Copycat System!